Imagine a wet, muddy, bare field just before spring planting. The soils are jam-packed with heavy, thick clay. Stormwater runoff over sloped areas has eroded the ground. Invasive weeds such as horsetail and Canadian thistle have secured footholds over the long winter. Now, imagine this field is part of your nursery. You need to restore this field to good health and prepare the soil for crop production. What do you do? Soil health is one of the most fundamental elements in nursery field production, and sometimes taken for granted. Yet paying attention to soil health will increase the sustainable lifetime of a farm, said Scott Eden, resource conservationist with the Marion Soil and Water Conservation District. A clay-rich field is not necessarily bad, explained Don Richards, president of Applied Horticultural Consulting Inc. However, one must take the type of production into consideration. “Making a good choice of growing sites is critical for a field operation to provide the ability to manipulate the soil to benefit the specific crop,” Richards said. The importance of site selection was emphasized as well by Dr. Ted Bilderback, former director of the JC Raulston Arboretum at North Carolina State University. To assess soil health, one must examine the site’s soil type, texture, drainage, erosion potential and soil fertility, Bilderback said. Beyond choosing the right location, there are other ways to build soil health. Richards said planting cover crops helps stabilize the soil, and is also a good way to add organic matter to it. Cover crops were also recommended by Dr. Charles Brun, a horticulture advisor with the Washington State University Extension Service in Vancouver, Washington, who has expertise in nursery field production, as well as Christmas tree and greenhouse production. Without cover cropping or soil amendments, repeatedly plowing and then turning over a field with a disc harrow has its drawbacks, Brun said. That powerful machine may be the most efficient way to rip through soil clumps and tear out old crops, but use it too much without improving the soil and you risk increasing the density of the soil, taking away “breathing space” for plant roots. 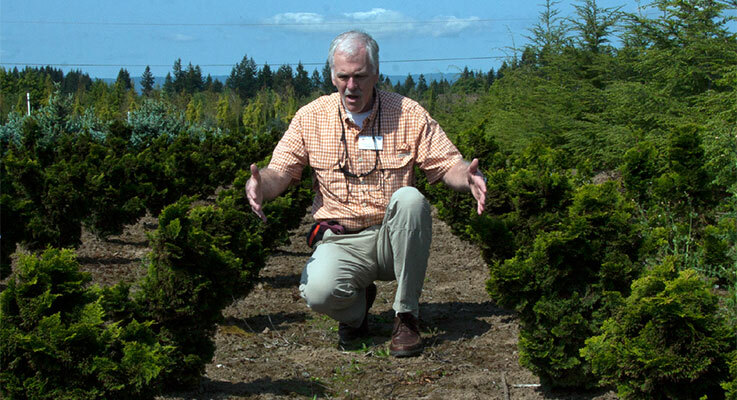 “Larger tree growers should invest in a permanent cover crop such as dwarf ryegrass,” Brun said. He also recommended summer cover crops that could be planted in between the aisles of nursery rows. Sorghum sudangrass, pearl millet, German foxtail millet and browntop millet are good choices if it’s possible to mow between rows. “It’s probably a better idea to use annual cover crops because they build the soil texture and tilth, and make a difference in how well soil works,” Brun said. In combination with a cover crop, Brun recommended a catchment basin and riparian buffer strips to reduce erosion and trap runoff. Maintaining grassy buffer strips is especially important for swale areas, rather than simply leaving them as muddy ditches. Eden said the most important way to build organic matter in the soil is to keep vegetation on the soil in the winter. Once again, imagine the muddy, clay-rich field. Now imagine that same field planted with the lush green stalks of perennial ryegrass and maintained with good production practices such as crop rotation. The benefits to the soil are significant. It now crumbles more easily, with fewer weeds. More earthworms thrive in this looser soil. It may not ever be perfect soil, but it will be better with a combination of sustainable production practices.